oreopsis verticillata ‘Moonbeam’ has fernlike foliage with tiny light yellow to lemon colored flowers throughout summer. With such a fine texture this plant works very well in hanging baskets, mixed containers, as well as for a border planting. Moonbeam Threadleaf Coreopsis can get 18″ tall and 18″ wide and is one of the most drought tolerant of the Threadleafs. This plant was named 1992 Perennial Plant of the Year. 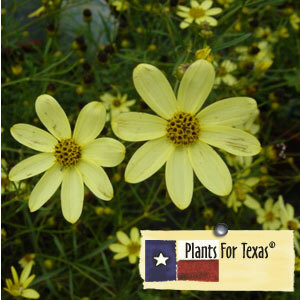 Coreopsis verticillata ‘Moonbeam’ is part of our Plants For Texas® Program, meaning it was Texas Grown, Tested in Texas to perform outstanding for Texas Gardens.